When we sold our house last summer the buyers negotiated to keep a lot of our furniture. I didn't even know that was a "thing" but they did it! It's a sore spot for David and me, but we're getting over it--if slowly. 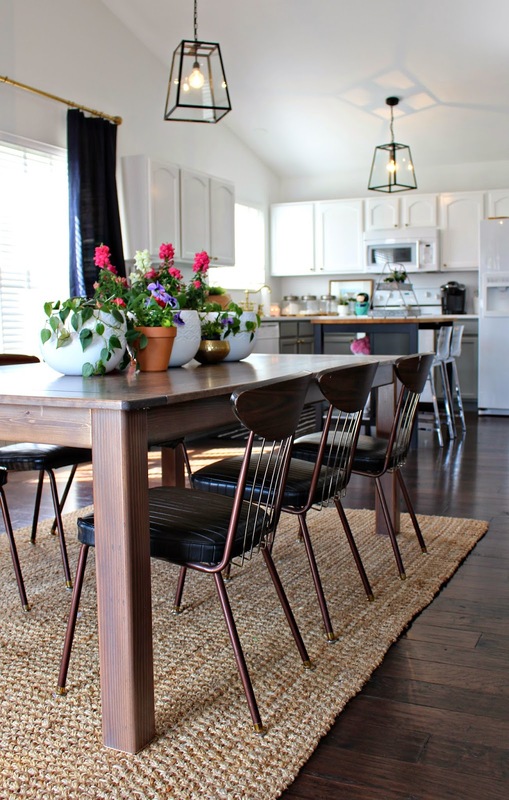 They wanted nearly every single piece of furniture we had in our home-it was so odd. We negotiated back and forth, and I put my foot down to keep our sofa [that we had just purchased! ], our arc lamp, and Theron's dresser. They had the nerve to ask for Theron's dresser. I mean, really? It was in my son's room holding my son's personal items. Low, I tell you. But I digress, I'm getting over it, remember? Haha! In the end, they got to keep a lot, including our dining room table that my sweet father-in-law custom built for us. I was rather emotional about the whole thing but he reassured us that he would build us a better table anyway! 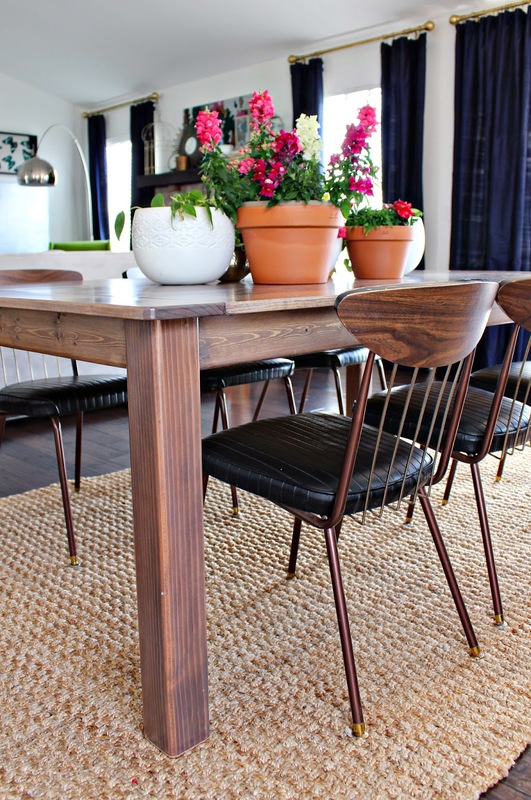 If the buyers wanted the table--let them have the table. "Less to move" he said. He was right. For the last 9 or so months we lived with a $100 table and chairs set that I found off of craigslist. I liked them well enough but when Theron's birthday came rolling around Dan hopped to building us a new and improved table. I've shared many a time that he can build anything. It's unbelievable. He measured the space, asked me what I wanted, and about two weeks later I had a table to stain. 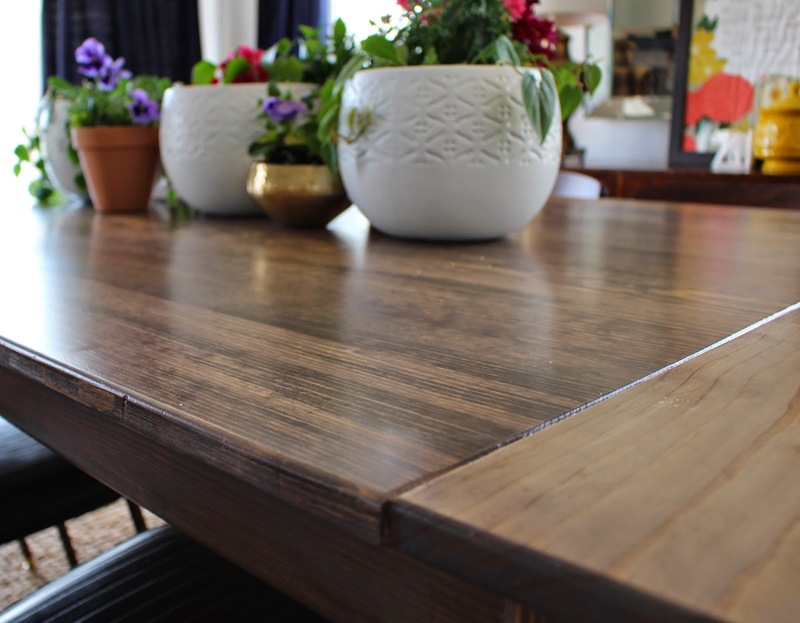 With our first table I stained it a dark deep walnut color, almost the color of our floors. But more recently I have been drawn to a more gray washed & lighter/imperfect stain shades. I ending up searching awhile on Pinterest after a trip to Lowe's for stain turned out to be unsuccessful. 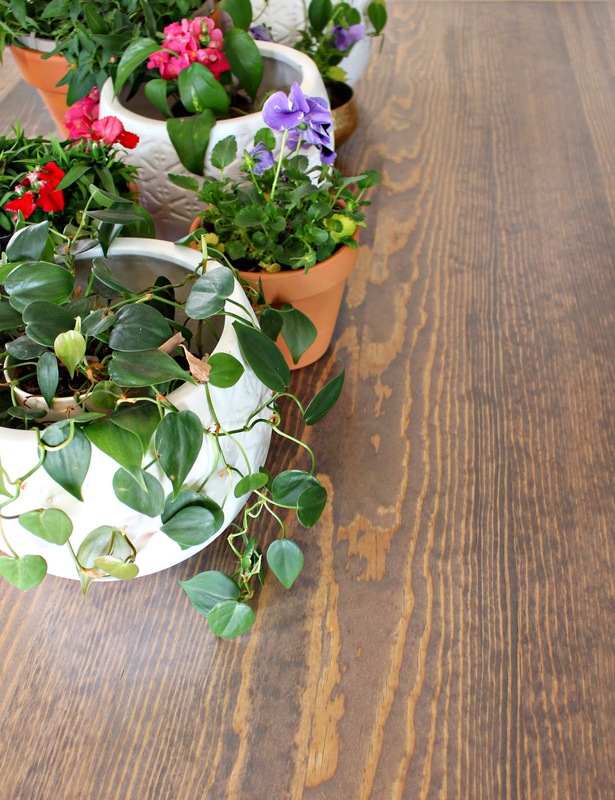 I came across this post about a custom stain made from two ready-made minwax colors [special walnut & weathered oak] and I was sold. There are so many tutorials on staining furniture and I basically followed them all. My father-in-law sanded the table perfectly so all I had to do was apply a pre-stain wood conditioner and then followed that with the special walnut stain. Then I applied, I think, 4 coats of the weathered oak stain over a handful of days. I finished it off with the water-based polycrylic top coat and brought it in for T's party. I think this pic was after the first two coats of walnut and weathered oak. The table takes up a much more substantial space in our dining room and of course has special meaning to us since it was custom built by our family for our little family. I think I could've gone even lighter with the stain but I love it even so! I kept the chairs from the craigslist table and like them so much that I'm in no hurry to replace them. I have plans to add upholstered captain's chairs on either end but I'm in no hurry to do that as well. Those flowers were originally purchased for outside but they look pretty happy on our table indoors. So that's how our new and improved table is hanging. We love it and hope you guys do, too! Looks amazing! That's such a great detail to have a table built by your own family. Goodness that is gorgeous- can you send him my way?? 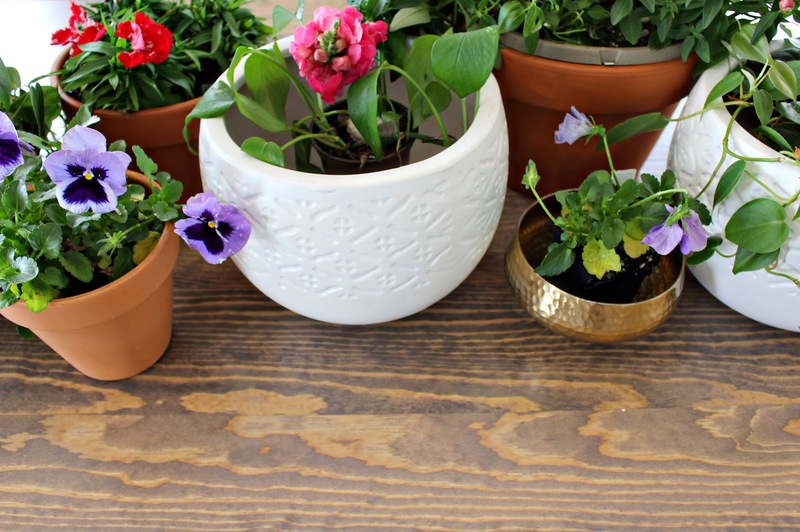 Also I'm totally jealous you can have pretty flowers on your table inside- my cats eat everything I put on our table, including the fake plastic plants. Sigh. What a gorgeous table!!! And I'm kinda' obsessed with your chairs! They are super cool. Wow, looks great! love your curtains too! I remember you mentioning something about the buyers keeping a bunch of your furniture and things. Id be fuming hot over it.But your father in law is a good man to just look on the bright side and agree to make you another. :) He did a beautiful job this time around also! Love, love,love everything you have done around your house so far! It's so odd how much furniture your buyers practically demanded. Granted, I can totally see where they were coming from--your furniture was GORGEOUS--but, seriously, who has the nerve to ask for such things?! It's absolutely crazy. At least it seems that you're recovering quite nicely. 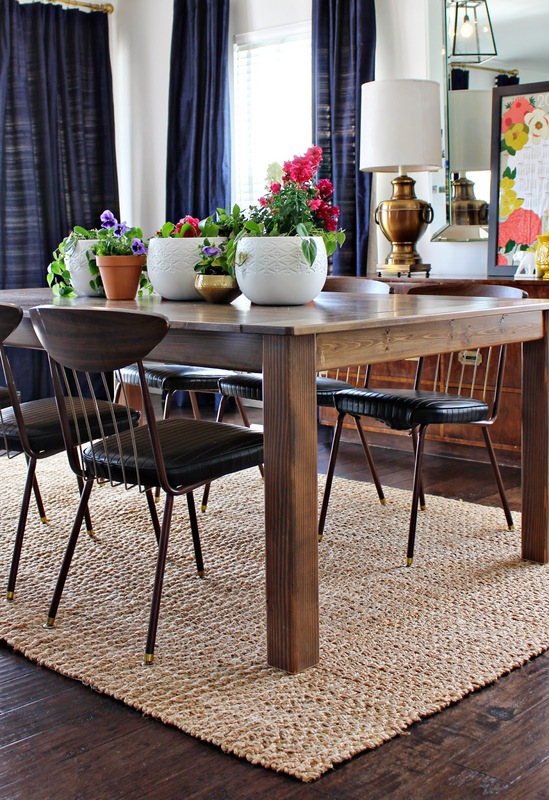 I always LOVED your previous dining table and the new version is just as beautiful. It's so incredibly special that it was built for you by family. I think the flowers styled on the table are perfection. I'm loving seeing your new home come together. You just have the touch, my friend! 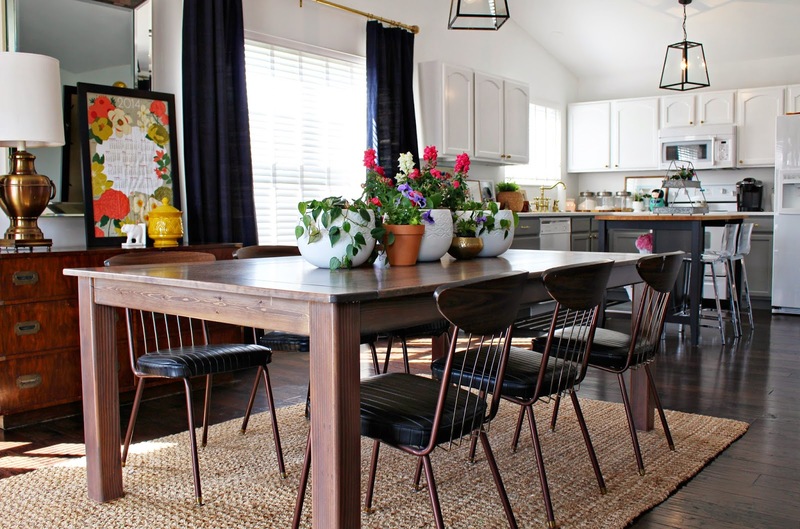 This whole space is stunning, and your Father-in-law's table is perfect. 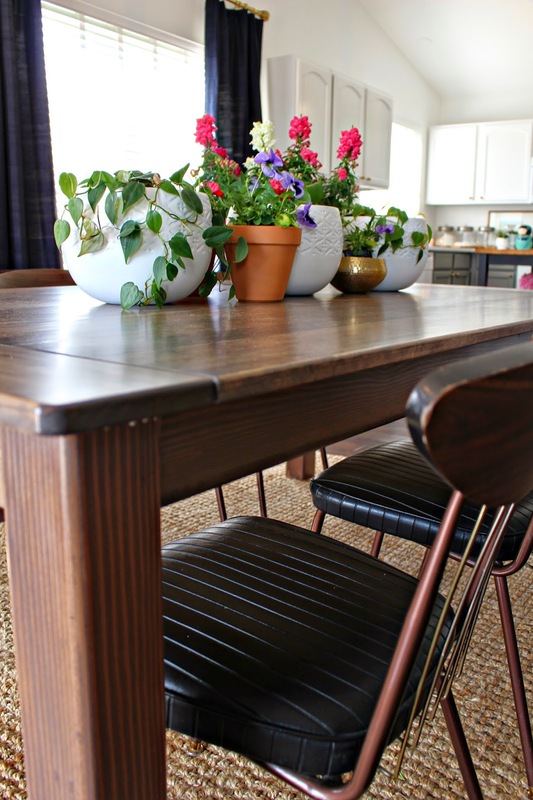 I adore his perspective on the table when the seller's wanted to buy your furniture. We had a sour experience with our buyer too, it's hard to completely let it go, but I'm working on it. I loooooooove the table, friend. Your FIL is a gem. Although I know you already know that. As for the buyers - ummm... weird? That's really strange to me that they would try to play the "give it all to me" card. Funny story - when I was in the 5th grade, my parents sold our house (that my dad had built). He had put in a basketball hoop for us as a gift and the buyers tried to strong-arm him into leaving it. He told them heck no. They came back and said they would walk without the basketball hoop. So he told them to go ahead - it was his kids' and it was a gift and it was going. In the end, they were bluffing and bought it anyhow. But really? A basketball hoop? And a handmade table? And a child's dresser? But I love your new table even more. So all's well that ends well, right? IT's perfect for your space. Wow that is an awesome table. Your table is so beautiful! Your FIL is so talented. He did an amazing job. Crazy how the buyers demanded most of your furniture. I don't blame them though you have amazing taste. Love your decor. Nice home interior designing and interior furnishing.